Conventional, centralized power grids as we know them require a lot of maintenance for expensive infrastructure to transport electricity over long distances. And, as some may remember from the prolonged blackouts that Hurricane Sandy unleashed upon New York City and a dozen other states back in 2012, one major disadvantage of centralized grids is that they aren’t completely reliable and can be quite vulnerable to disruptions. Now, a New York-based startup is proposing an alternative: a small-scale, community microgrid that will allow local residents to buy and sell the energy they produce from rooftop solar power installations, using the existing energy infrastructure and the blockchain, the same technology that underpins open source, peer-to-peer cryptocurrencies like Bitcoin. Best of all, you don’t even need to have solar panels installed in order to participate. Brooklyn Microgrid is the organization that’s spearheading this innovative initiative, the first of its kind in the state. It which uses TransActive Grid (TAG), a joint venture currently being jointly developed by LO3 Energy and Consensus Systems. The TransActive Grid is a distributed consensus system through which participants in the community microgrid can securely make their transactions. It is a decentralized and sustainable energy management solution that combines the transparency and security offered by blockchain-based “smart contracts” and currencies, in an emerging peer-to-peer economy. Through this model, individual members and businesses are able to engage in direct energy trading, buying excess solar power generated locally by other members, instead of relying solely on the big utility companies. The system will use Ethereum, a public blockchain platform with a smart contract functionality, which permits microgrid users to commit to contracts that cannot be falsified or misrepresented. Transactions and energy use will be updated automatically and in real-time through this distributed network, using a cryptographically secure list. 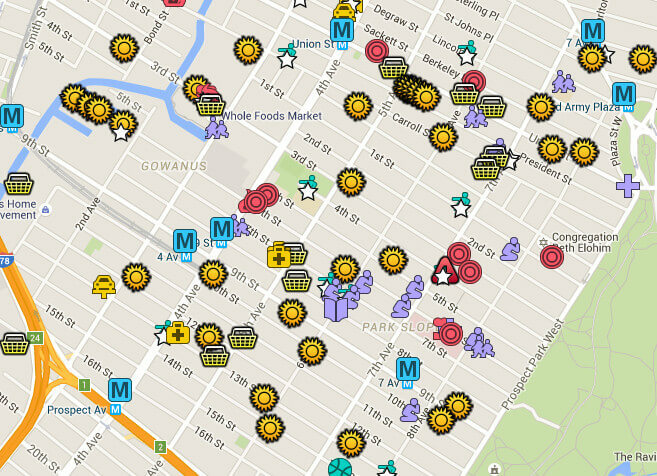 So far, the project will be launching in the neighborhoods of Gowanus and Park Slope. But the company’s bigger vision is to radically change how electricity is bought and sold — while also stimulating the local economy through renewables. In addition to generating benefits for the local community, this consensus-based microgrid model could also have a lower impact on the environment. With an estimated 6 percent of energy being lost because of long-distance transmission and distribution, any energy generated within the neighborhood microgrid means that less massive infrastructure is needed, making it a much more cost-effective and sustainable option in the long run. With local state governments like New York, California and Connecticut already working to develop a wider, supplementary network of microgrid energy sources, these locally based grids could someday become a much-needed backup to the centralized system during emergencies. Ultimately, it’s about giving residents more choices, and empowering them to take charge and participate in their local economy, whether it’s through hyper-local energy generation, or by purchasing electricity directly from the folks next door. Developing a connected network of distributed energy providers will also boost energy efficiency, and letting participants manage their own resources will strengthen community resiliency. This new business model based on a distributed approach looks like it could disrupt the old way of getting your electricity, but in the bigger picture, it could create green jobs, and generate more financial incentives for ordinary people to switch over to renewable energy — something that’s not only good for everyone, but also for the planet too. In the meantime, Brooklyn residents in Gowanus and Park Slope can show their support by signing this petition, and check if they can join the microgrid by requesting an assessment. Read more over at Brooklyn Microgrid.